Cheap Bike Racks - Save money on Bike Storage! 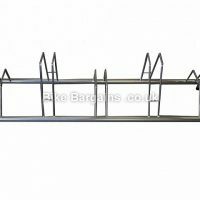 This section covers both car cycle racks, as well as bike storage solutions for your home, shed or garage. Please ensure that the rack will fit your model of car, as well as your bike(s) prior to buying – most are pretty bulky, so will be a pain to return! With storage racks, there is less to worry about, as long as they (and potentially your wall, in the case of wall mounted racks) can handle the total weight of your bikes. Most models will state the limitations of the rack in terms of weight and capacity in the description, so please check before clicking the Buy button! Depending on where the rack is to be mounted, it might also be worth checking whether it’s weatherproof – you don’t want a rust covered bike! You may also want to purchase a sturdy lock to keep your pride and joy safe. Finally, for those who don’t want to carry their bike on the outside of their car, you may wish to invest in a bike bag instead. Anyway, onto the racks..